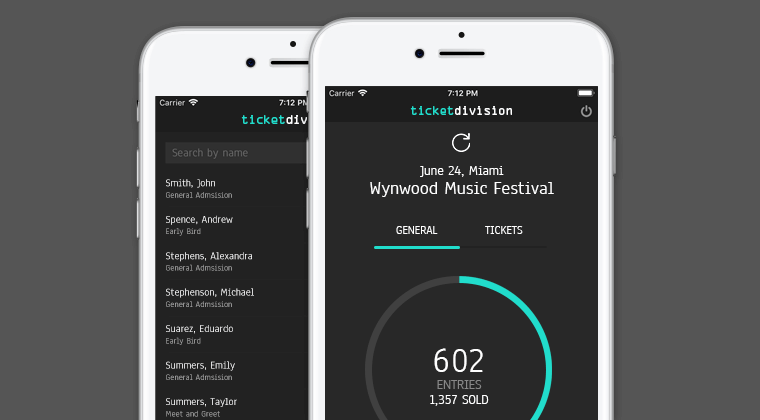 Ticket Division free scanner app for Android and iOS devices receives an update: new design, improved authentication process to keep devices connected throughout selected events, and performance improvements. The update was released simultaneously on AppStore and Google Play for all Android and iOS devices. Click the button of your choice below to download or update the app on your operating system. Ticket Division Scanner v2.0 gets a new event-monitoring panel design. Promoters and venues will now see the progression of entries on a circular chart (also called donut chart) for quicker read of check-ins. Entries per ticket type now have their own panel that can be selected with a switch located on the event-monitoring panel. Global entries and check-ins per ticket type are also one swipe away. Swipe right or left to switch from the global statistics to the ticket breakdown, and vice versa. Ticket Division Scanner v2.0 fixes an issue reported on iOS devices that may occur during intensive use of the device while TD Scanner remains in the background. For instance, door staff may open games or other memory-consuming applications while waiting for guests to arrive. In such cases, Apple devices may free up memory space used by applications in the background and reset Ticket Division Scanner, in which case the user would need to authenticate again, slowing down entries to the event. Ticket Division Scanner v2.0 introduces semi-permanent sessions and allow door staff to remain logged in for the entire duration of the selected event. Should the iOS device reset TD Scanner in the middle of the event, the app will automatically attempt to authenticate as soon as the user opens it again. Among the interface upgrades Ticket Division Scanner is receiving, this new version provides better handling of network failure. The version 2.0 also brings the application up-to-date with the latest version of both operating systems iOS and Android, which comes with minor performance improvements and lower memory usage.